Holiday Dress Shoes. These adorable maryjane flats come in Toddler, Little Kid, and Big Kid sizes. Adorable ballerina shoes made for your princess! They're not just cute, they're comfortable too! Comfortable and adorable - these shoes make a statement but don't cry for attention. 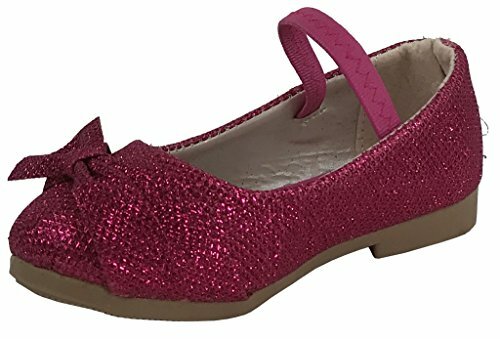 Every little girl needs a pair of these dressy glitter flats; very easy slip on shoes. These shoes are perfect for any occasion. These adorable slip on glitter ballet flats will complete any outfit! They are easy slip on dress shoes in a mary-jane style. Lace and glitter will make any girl feel like a princess! The cushioned inside sole makes these flats extremely comfortable and practical for your toddler, little girl, or big girl. Kids are bound to be jealous of your daughters beautiful shoes.